Review: At its core, One Plus One is a love story about opposites who attract. 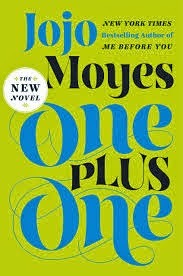 Jojo Moyes does a great job crafting the story so it reads more like fiction instead of chick lit or a cheesy romance. Jess has a tough life but a great attitude and ends up on a road trip with Ed, a successful tech millionaire going through some major work issues. While this was well-written and I liked it, I never bonded with Jess or Ed. I liked Jess well enough and Ed grew on me as the book went on, but I never felt that vested in their relationship. I did really enjoy Jess's children, who dealt with a disappearing father and bullying. I kept waiting for a big emotional punch (her book Me Before You, one of the best books I've read all year, literally left me weeping) but while this book had it's sad moments, the overall tone was relatively positive.